Hostelworld.com is a fabulous site that caters specifically to those seeking hostels in a variety of countries. It offers up quite a variety of services and options, and it now has a companion Android app to go along with it. The app is actually even better than the Website and offers up some interesting and essential features that many backpackers and travellers will find that they really can’t do without. First of all, it does the basics perfectly. You can search for a place to stay, check its reviews and ratings from fellow travellers and book a room, including private and dorm rooms. 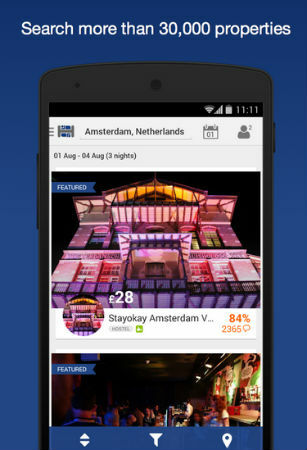 The app is impressively fast at finding a variety of places to stay in a lot of cities around the world, and it has a really cool local search with a map showing you nearby accommodation. This feature works really well and is much faster than I expected, which will be a bonus when you are tired and just need a place to stay quickly. There are 35,000 properties to choose from in over 6000 locations, so finding somewhere shouldn’t be a problem, and with 3.5 million verified reviews of those places, you know you are not walking into anywhere with your eyes shut. – Available in 7 languages: English, Spanish, French, German, Italian, Swedish, and Brazilian Portuguese. – Read 3.5 million traveller reviews, competitive prices, pictures, maps and more! The app allows you to scan your credit card for checkout, which really is a superb feature and one that far more apps should use and it really makes use of the format of the phone. The app is attractive, with some decent photos of the places you will be staying in, and it has a nice overall theme with a nice use of fonts and colour to give it a classy look. The app is very intuitive to use, with a nice clean interface and smart placement of icons and options, meaning that you will never get lost within the app, trying to find out how to do something. 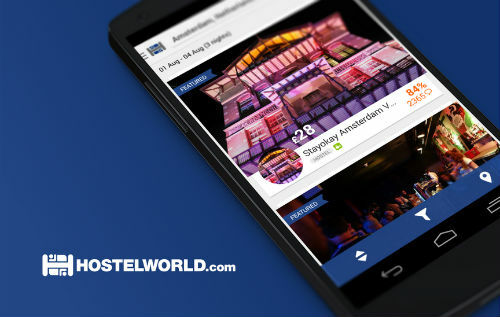 Overall, Hostelworld.com is an essential app for travellers and backpackers, and one that really gives a helping hand when it is needed. Highly recommended.